University of Pennsylvania Press, 9780977164431, 191pp. At a time when illustrators were national celebrities, Howard Pyle was one of the most successful. A prolific artist and author, Pyle wrote and illustrated for most of the nation's major magazines. His illustrations accompanied the writing of leading authors, including Mark Twain, Robert Louis Stevenson, and Oliver Wendell Holmes. Collaborating with significant historians, including Woodrow Wilson and Henry Cabot Lodge, he helped to fashion the nation's notion of colonial and federal history. And in his own books, Pyle produced enduring versions of Robin Hood and the Arthurian legends and shaped the American vision of pirate life. 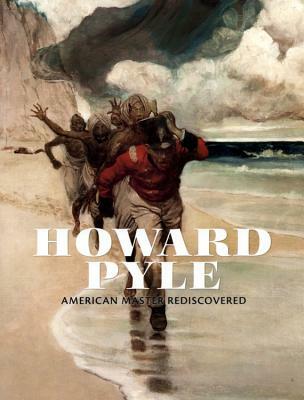 "Howard Pyle: American Master Rediscovered" presents the most recent research on American illustrator Howard Pyle (1853-1911), with thematic essays by leading scholars in art history, history, and literature. The book, richly illustrated, presents a fresh perspective on Pyle's familiar images by exploring his interaction with the art and culture of his time, effectively repositioning him within the broader spectrum of nineteenth-century art.In a challenge to the art historical canon, this book locates Pyle within the mainstream of nineteenth-century visual art, explicating how he influenced and was influenced by the artistic output of his era. Individual essays explore such topics as Howard Pyle's sources in contemporary French and English art, how contemporary ideas of manhood are articulated in Pyle's writing, the effects of Swedenborgianism on his work, and his influence on film and popular illustration. The book also features an analysis of Pyle's working methods and how they translated into effective illustrations. Heather Campbell Coyle is Curator of American Art at the Delaware Art Museum.